The election of Donald Trump as President of the United States represents a temporary reprieve for the United States of America as a majority-White country. It could become much more than that, but it is not yet evident that it will. Trump talks about keeping illegal aliens out entirely, and has mentioned deportation, with priority given to those who commit crimes beyond simply being here illegally. Of course the government should be doing this! How did this ever become controversial? 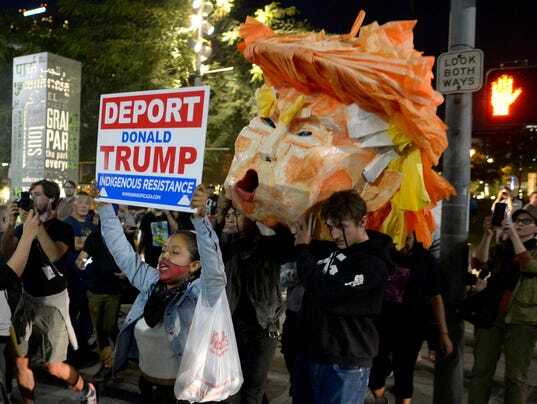 However, if President Trump deports every illegal alien and prevents all further illegal immigration, that will not be enough to preserve the White majority in the United States for very long. In the first place, as Ann Coulter has been saying, legal immigration is an even bigger problem than illegal immigration, but Trump has not proposed to curb that. Apart from any question of immigration, there is the differential birthrate between the non-White and White populations. There is no way for the government to address this problem without taking actions that would presently be considered unconstitutional. The hour is very late, in regard to this demographic problem in the United States. The direness of the situation is reflected in the fact that Trump (according to current widely acknowledged figures) lost the popular vote and won only through the quirks of the Electoral College, due to the fact that Hispanic populations are concentrated in a few states and not evenly distributed like the White majority. Of course it will be a disaster even for many non-Whites in the United States if Whites cease to be the majority. Rush Limbaugh refers to the White population as "the people who make the country work." We can only hope that Trump, or somebody, will recognize the compelling need to preserve a White majority, and find a way, despite restrictions of the Constitution as currently interpreted, to preserve the country's future. The fact that there are already anti-White tantrums against Trump's election is a hopeful sign. It was similar leftist tantrums in Germany (the Reichstag Fire being one manifestation) that facilitated Hitler's assumption of emergency powers so that he could do what needed to be done. Let that anti-White rabble keep up its disturbances. Let them become more and more outrageous. There is hope for us in their irrational behavior. Meanwhile you will see the anti-White elite and their lackeys like George Will scream bloody murder if Trump even presses the limits of executive power as much as Obama has done already. George Will explicitly stated this position immediately after the election, in anticipation of Trump's not behaving like a typical Republican. On the bright side, even before he won the election, Trump's candidacy was very educational for the American public, in terms of shifting the range of acceptable public discourse, and bringing hidden problems to the surface. Most notably there is the conflict between the interests of the White majority and the "Neoconservative" Jews like Krauthammer and Kristol, and crypto-leftists like George Will and the Bush family, who had embedded themselves in the Republican Party and hobbled its potential for representing White interests. Such infiltrators are now widely recognized as enemies of the White majority because of their reaction to Trump. This lesson needs to be kept in mind, because just as they tried to prevent Trump's election, they will now try to prevent Trump from making any significant permanent changes to stop the country's decline. Their attempts to make nice and to pretend once again that they are really on our side of course should be rejected. For the country's survival, these people really should be removed from the body politic, "as a physician would purge a bacillus," in the words of Mussolini. But it seems highly unlikely that Trump will do any such thing, as long as these subversives cannot be shown to have committed any statutory crime. Trump's enemies have called him a "racist autocrat" but that seems to represent what those anti-White subversives fear and expect, rather than Trump's actual positions. We can hope that he will grow in that regard. Meanwhile, the greatest good accomplished by the election of Donald Trump may be outside the United States. Of course it will be good for Russia and Syria if the USA ceases its saber-rattling and covert support for religious lunatics, but it also happens to be the case that US influence operates behind the scenes in the politics of Western Europe, especially Germany. It was US pressure that induced Germany to begin reparations payments to the State of Israel, and later to import unnecessary Turkish guestworkers. It is a good bet that behind-the-scenes manipulation has something to do with the current flood of non-White immigrants in Germany, and especially the inviting hospitality of "Mama Merkel." Trump's election will give Europe the possibility of taking necessary actions to recover from this. In regard to the United States however, if Trump does not greatly alter the country's demographic decline, it seems practically inevitable that he will be succeeded, before long, one way or another, by a real autocrat. Thank you for the message and your efforts. Good Luck and Best Wishes. I haven't much faith in Trump keeping any of his campaign promises. No presidential candidate that I can recall in my lifetime has ever done what he said he would do once he's entered The White House. They've all dragged us into new wars, or continued to waste American blood and treasure on old ones. I'm glad Hillary was defeated, but I'm afraid after the l945 defeat of The Axis it's the deluge on "high","medium" or "low," but never fully "off". Don't fret, the stupidity of the enemy is doing what Trump wouldn't. Their riots and attempts to still stop Trump has done wonders to turn lukewarm support into 100% Pro-White. Expect niggers to go out and attack Whites and celebrate like the stupid mindless apes they are. We will get America back. Only the complete and TOTAL destruction of the enemy is acceptable this time. A President is not a King and has not the power to legislate, so without the consent of Congress, or in case of crime or usurpation the complicity of the House in Congress. U.S. citizens' only constitutional power (force) in government is the ballot box to vote out 435 Representatives of the House in Congress every two years. I am sorry to inform you that the answer to the current crisis is not in the Constitution. This fact, however, has never inhibited past US presidents from doing whatever they deemed necessary in an emergency. What other "citizen" remedy, than the ballot box, do you suggest? We agree, I think, that America has a criminal government and I think for over 100 years, elected or reelected, every two years, by citizen voters. I see no justification blaming the Constitution, it does not enforce itself. A law does not prevent crime. Educating Constitutionally and religiously ignorant citizens is the proper remedy to correct the corrupt government of this Republic, the only correct remedy in this Republic. U.S. government corruption (crime and usurpation) "continues" only with the complicity of the House in Congress, House corruption "continues" only with the complicity of citizen Voters. The House has the power of impeachment (Article I, Section 2, Clause 5), and the power of the federal purse (Article 1, Section 7). The House is the most powerful branch of the federal government, and citizens directly elect, or not reelect incumbent, Representatives of the House every two years (Article I, Section 2, Clause 1). Many U.S. Patriots know about Germany 1919 to 1933, but what they don't get is what Germany's citizens did to or about Jews; NOTHING, because like U.S. citizens Germany's citizens had no legal power to do anything to or about a Jew, nor the whole tribe of Jews. Germany's citizens elected a government in 1933 that had the proper power to rid Germany of the Jew plague. The U.S. government has the proper power to revoke dual citizenship and deport such citizens. The U.S. government also, has the proper power to address the enemy. U.S. citizens do not have either of those legal powers. It will be November 2018 before U.S. citizen can use the power of the ballot box to vote out 435 corrupt Representatives of the House in Congress. Think it ain't all of them? straighten out your thinking. Jews own, or control by mob tactics, virtually everything in America going back to appointee Bernard Baruch of early 1900. What Jews do not own or control in America is U.S. citizens of each of the 435 Districts choosing their Representative for the House in Congress. Believe that "choosing" in rigged? straighten out your thinking. I suggest forming a committee of five or seven members for the purpose of appointing a volunteer to educate citizens, in their Duty in Citizenship, in each of the 435 Districts. What is suggested we, U.S. citizens, do to or about Jews? ... The Israeli-Palestinian conflict is one of the world's major sources of instability. Americans are directly connected to this conflict, and increasingly imperiled by its devastation. Hadding - you are correct, current the crisis is not in the Constitution. The continuing crisis of today goes back at least to the Balfour Agreement, and the blackmail of President Wilson which continues because of an ignored 1789 U.S. Constitution. Ignored by both those U.S. Lawmakers that take an Oath to support the 1789 Constitution and U.S. citizens that elect those Lawmakers. The founding purpose of the U.S. government is to govern (republican form) and protect the States; Article IV, Section 4, Clause 1. Then leave citizens alone. What I am saying is that the necessary actions to fix the current problems are not within the powers given to the federal government by the Constitution. This is why the Romans invented dictatorship. They understood that sometimes there would be a crisis that could not be handled through ordinary constitutional means. They would appoint a dictator for a finite period to deal with the problem. There is no provision in the US Constitution for appointing a dictator, but some of our presidents have nonetheless been able to exercise extraordinary powers when there was an emergency that seemed to justify it. My view: one way or another, sooner or later, we are going to have a dictator. Better sooner than later, since the problem will only get worse.